A La Plata Electric Association committee will explore and study alternatives to purchasing power from Tri-State Generation and Transmission, a wholesale power supplier. Tri-State caps how much outside renewable electricity co-ops can purchase. La Plata Electric Association is exploring alternatives to purchasing power from its wholesale power supplier, Tri-State Generation and Transmission. Tri-State caps how much renewable power LPEA can purchase from outside sources at 5 percent, and that has generated some interest among co-op members in buying out of the contract as the price of renewable energy has fallen dramatically. LPEA’s contract with Tri-State does not expire until 2050. Kit Carson Electric Cooperative in Taos, New Mexico, showed that leaving Tri-State was possible when it bought out of its contract in 2016. It plans to generate enough solar energy to power its grid during the day by 2022. Whether LPEA should explore a buyout was a contentious issue in the April election. As a result of that contest, balance of the board shifted in favor of more aggressively pursuing renewable energy. In August, the LPEA board voted 11-1 to form a power supply committee that will explore the wholesale power market and the value of its contract with Tri-State, said Ron Meier, manager of engineering and member relations. 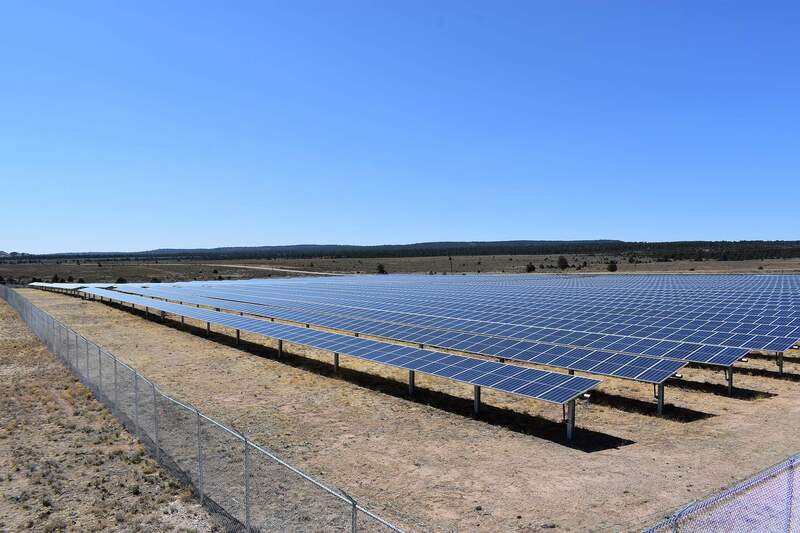 “What we’re trying to do is number one, come up with cleaner energy, and number two, lower the cost (of electricity),” said LPEA board member Guinn Unger. Committee members include Britt Bassett, Tim Wheeler, Kohler McInnis and Jack Turner. Turner is a non-voting member. CEO Mike Dreyspring and Dan Harms, manager of rates, technology and energy policy, are also on the committee. The committee is expected to consider the costs, reliability and risks associated with buying power from new suppliers, according to objectives the committee voted on Thursday. It will also analyze how power would be delivered to LPEA and the cost of transmission, if the co-op leaves Tri-State. The committee is authorized to hire consultants to analyze what it would take for LPEA to buy power from the open market and to provide a value of the Tri-State contract, Bassett said. LPEA would like to have consultants under contract to do the analysis by November and reports could be done by February, Bassett said. The committee does not have any power to make decisions for the co-op. It is expected to provide its findings and any possible recommendations to the LPEA board by the end of March, Dreyspring said. The committee is also meeting with outside experts to better understand the wholesale power market. This week, the committee heard from representatives of Guzman Energy. Kit Carson signed a 10-year contract with Guzman after it left Tri-State. Guzman agreed to pay Tri-State $37 million to allow Kit Carson to exit its contract and provide Kit Carson with electricity from the open market. The company is an energy-services provider that finances, builds, owns and operates energy generation facilities across North America. It also purchases electricity from the open market. Guzman President Chris Riley talked with LPEA’s committee about changes in the power market in recent years and how the cost of solar and wind power have continued to fall. “It has come down faster than anybody thought it would come down,” he said. At the same time, the price of power from large generation and transmission companies that rely more on traditional power sources has continued to rise. It is possible the low cost of the renewable energy could attract LPEA’s large industrial customers that could build their own generation facilities, he said. However, leaving the contract with a large generation and transmission company does involve risk, time and money, Riley said. Kit Carson members are paying off the Tri-State exit fee through their rates; once the exit fee is paid off, members’ rates will drop, he said.